Freedom bus giant puppets vs the wall. Photo: Alternative Information Centre. The Freedom Bus has just completed its first Freedom Ride, bringing together Palestinians and internationals on a tour to communities all over the West Bank, occupied Palestine. The Freedom Bus visited some of the most besieged areas in the West Bank. Palestinian actors and musicians enacted personal accounts of community members, touching on issues such as home demolitions, land confiscation, army invasions, arbitrary arrests, settler violence, water shortage, the effects of the Wall and much more. Interactive theatre and music performances were complemented by university seminars, community tours, hip hop concerts, giant puppet shows and marches. The Freedom Bus made its first stop in Faquaa, where although the village’s name means spring water bubbles, the villagers are struggling to get access to clean water due to Israel’s separation barrier and land confiscation. The performance was watched, from a distance, by Israeli soldiers looking through binoculars, photographing and filming the crowd over the barbed wire. The bus continued on to Nabi Saleh, a small village surrounded by settlements, where we heard several stories from women in the village who are very involved in the non-violent resistance. A newly released prisoner also joined the performance, and as the villagers joyfully crowded around him to welcome him home he told the audience about his experiences of being held in Israeli prison. In Aida Camp, close to Bethlehem, the Freedom Bus actors had the opportunity to perform in a beautiful purpose-built outdoor theatre directly next to the Separation Wall. As we performed in the shadow of the wall, the lights of our show lit up the resistance graffiti. It was a truly astonishing setting. An elderly man began his story with a joke: “When people come into your house, they usually choose to enter through the front door. But in the Second Intifada our visitors [Israeli soldiers] came through the walls.” He was referring to the Israeli practice of bombing the walls of neighbouring houses to move through the camp internally. His house was invaded in this way and occupied by a group of soldiers for seventeen days before the army set off a bomb that exploded through the walls of five adjacent houses. In Al-Walajah, a village facing impending strangulation by the Separation Wall, the Freedom Bus joined community members in a creative march to protest the attacks on their land and homes. The villagers of Walajah have owned the land for generations, but only inhabit one side of the valley after they were expelled from the location of their original village in 1948. Soon, the valley will also be lost and the wall will essentially imprison the village. The Freedom Bus also headed to Hebron or Al-Khalil, one of the biggest cities in the West Bank and historically a trading centre. These days, however, the central market places of Hebron are silent. The shops are closed and Palestinians are constantly threatened with attack by the extreme hard-line settlers that have invaded the top storeys of Palestinian homes. Many homes in the Old City have been vacated. “Welcome to the ghost town,” said one little boy. It is hard to do justice to the experiences of this Freedom Ride. The international participants left occupied Palestine with memories for life. 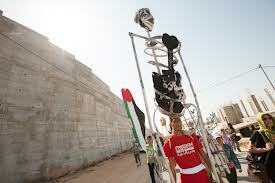 Perhaps the strongest impression was the steadfastness and creativity of people living under occupation. Their stories, brought to life by the Freedom Bus actors, acted as a remarkable testimony of a collective struggle to live with dignity in the face of oppression. This historic Freedom Ride would not have been possible without your support. As we look ahead towards what we hope will be many more rides, we invite you to join us on our continued journey. Stay tuned for upcoming Freedom Bus videos on The Freedom Theatre’s YouTube channel. On October 7th, Zakaria went to the scheduled court hearing in Jenin that officials had assured him would be the final one. After a few minutes, the judge stated that the hearing was postponed until the following week. At this point one has to wonder whether the primary purpose of this so-called judicial process is to keep Zakaria Zubeidi in limbo. It’s not over yet but thanks to all of you, the immediate threat to Zakaria’s life has been averted and he is home with his family. He recorded this message to people who have supported him during the long months that he spent in prison.